In this article I would like to explain the concept or the technology carrier aggregation in connection with LTE. 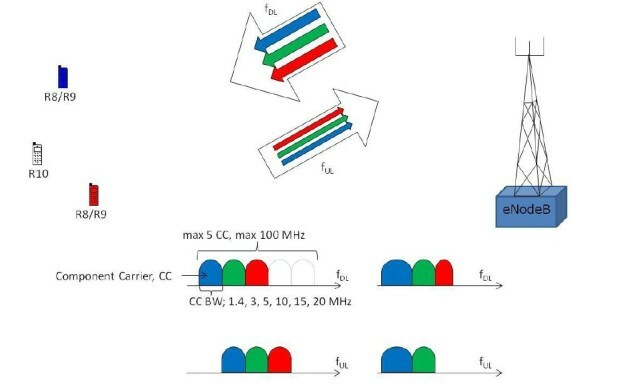 Carrier aggregation, in short CA , is an important component of the 3GPP release 10, and thus of LTE-Advanced ( LTE-A ), which was specified in 3GPP Release 10. LTE-A consists of several components, including CA, for example 8 × 8 MIMO, and LTE UE categories 6, 7 and 8. In addition to a higher speed (up to about 1.2 gigabits per second downstream in LTE cat. 8 UE) compared to normal LTE, improved data rates on the cell edge are also a plus for LTE-A. However, in spite of various optimizations, one will need more frequency spectrum in the future in order to be able to further increase the data rates and meet the increase in global traffic – the peak data rates of LTE-A can only be achieved if up to 100 MHz are bundled. And this is where Carrier Aggregation is used. The topic affects almost all mobile network operators in the world: they do not have enough coherent frequency spectrum to easily offer the high data rates of LTE-A. In Germany, for example, there is only 20 MHz bandwidth available in the frequency range around 800 MHz – paired in 4 blocks, ie 10 MHz for the downlink and 10 MHz for the uplink. In the configuration currently in use (2 × 2 MIMO, LTE UE Cat. 3), a maximum of 75 MBit/s can be reached in the downstream, although not much more than 60 MBit/s is possible. Blocks with CA, the network operators are able to bundle different frequency blocks into a large block for the first time. After 3GPP release 10, the upper limit is at 100 MHz, although a later expansion is of course not excluded. In the medium term, however, it is likely to be a bundling of 40 to 60 MHz. Intra band, contiguous:this is the simplest CA method. Two or more frequency blocks are clustered, contiguous and within a frequency range (Intra band). So, for example, 2x 10 MHz in band 3 (frequency range around 1800 MHz). The terminal does not need any great hardware changes because it perceives the aggregated channel as a large channel and therefore requires only one transceiver (transceiver). Intra band, non-contiguous: in this method, two or more carriers are bundled, these frequency blocks being not adjacent but lying in the same frequency range. On the end of the terminal, two or more transceivers are now required to use the aggregated band. Inter-band, non-contiguous: this CA method is likely to be the most widely used in the future as it is most likely to be true for network operators. In this case, frequency blocks from different frequency ranges can be bundled in order to create the largest possible frequency block. A possible scenario would be, for example, the combination of spectrum from band 20 (around 800 MHz) with spectrum from band 3 (1800 MHz). As you can imagine, several transceivers and further optimizations are necessary in the terminal, which can have a noticeable effect on the energy consumption. Especially in the case of carrier aggregation using inter-band, non-contiguous, it is inevitable that there will be differences in the size of the individual cells. Thus, with a terminal with CA support close to an LTE transmitter (eNodeB), very high speeds will be achieved as the terminal can use a lot of bundled spectrum. A few kilometers from the transmitter is possibly only LTE800 receivable and CA brings no more advantage. As can be seen in the above, there is always a Primary Serving Cell, or PCC, a “main cell”, which ensures the supply. The other cells (SCC) serve merely as a support for user data, in other words to increase the bandwidth. Depending on the terminal, the PCC can be different, depending on various factors, for example the respective energy consumption in the terminal. This, of course, requires a lot of optimization both in the network planning and in the manufacturers of the modems for mobile devices. Of course, CA and thus also LTE-A is down-compatible with “conventional” LTE. Old and currently available terminals are therefore still usable in the future. Nevertheless, if you want to use the higher bandwidths or carrier aggregation, you obviously need a new terminal. Here, again, the LTE UE category has to be considered, CA alone is not enough to achieve speeds in the gigabit range.